Born in Fort William, Ontario, Jeff Heath moved with his family to Victoria, B.C., when he was a year old. Heath would blossom into a top power-hitting prospect and was signed by the Cleveland Indians. His .383 batting average and 187 RBIs with the Tribe’s minor league affiliate in Zanesville in 1936 reinforced his blue chip status and earned the young Canuck a big league promotion that September. In his major league debut on September 13, 1936, Heath was upstaged by future roommate, Bob Feller, who would strike out 17 batters that same game. The 1938 season was Heath’s breakout campaign. That year, he finished second in the American League batting race (.343) and recorded 21 homers, 112 RBIs and a league-leading 18 triples. 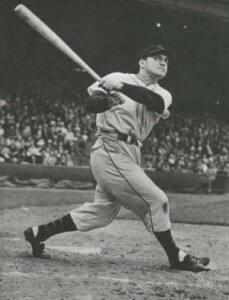 He would top that season in 1941, when he became the first American League player to register 20 doubles, 20 triples and 20 home runs in a season. He also hit .340, stole 18 bases and was selected to his first all-star team. In 1945, he was dealt to the Washington Senators, where he played for two months, before being swapped to the St. Louis Browns. In December 1947, he was sold to the Boston Braves, where he was hitting .319 with 20 home runs and set to participate in his first World Series when he suffered an ankle injury sliding into home in the final week of the 1948 season. His ankle was slow to heal and Heath would play just 36 games in 1949. He would retire the following season. For his career, Heath hit .293 with 194 homers and ranks among the greatest Canadians to play in the big leagues. To view season by season MLB statisitics click HERE.